Jump Up is a student-led experience for children aged 8 years and above. The purpose of the program is to empower children as participants in bringing about a thriving, sustainable and socially just human presence on earth. We believe that children are well aware of what is happening in our world, that given the opportunity they name it like it is, and often have inspiring and practical ideas about how to make a difference. The Jump Up program empowers children’s innate capacity to experience their interconnection with the world by sowing seeds of understanding that they are part of an ever changing human story of evolution, cultural customs and worldview. The program is listed on the creative commons with an attribution license and is being offered by multiple schools in three continents, being predominantly active in China during 2018. Our materials are highly flexible, they can be used at home, in class settings or as components of one off workshops at camps or gatherings. The most powerful results have been achieved when children use the program materials as part of an ongoing student lead inquiry project, either at home with parental guidance, at school or on a holiday camp. We invite you to engage your imagination for using the Jump Up materials within your particular setting and to adapt the materials for your needs. Information Booklet, a detailed introduction to the program. DL Flyer, for use when promoting the program. 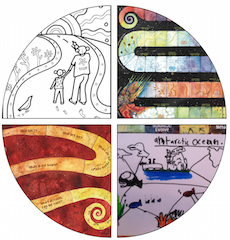 Evolution of Earth Activity a must for experiential workshops designed to enliven ecological connection – this activity blows everyone’s mind, regardless of their age! The Jump Up Program materials are registered on the Creative Commons and are available for download here. Donations for the use of these materials are invited at your discretion via Give Now; all proceeds will contribute to implementing the Be The Change Australia Jump Up Program. Donations made from within Australia are eligible for Tax Deductibility when over $2. Donations made from outside of Australia are not eligible for Tax Deductibility. After you have downloaded the files, click on the download icon in the upper right corner. Do this even if you have gotten an error message. A team of over 20 professional educators; including principals, teachers, Australian Indigenous elders and parents developed the Jump Up program materials and resources, during a rigorous three year action research and action learning development phase demographically diverse primary schools (2010-2013). These materials have now been trialed in 3 continents reaching over 500 children, in numerous homes, as a specialist program in an after school setting and as workshop elements at festivals, gatherings and professional development conferences. The materials continue to be updated each time they are delivered. There are 8 topics in the Jump Up program. The first four topics (Who and I? Who are we? What do we really need? What is our human story?) are an extension to and precursor of the Awakening The Dreamer Symposium experience. Designed for children, they are equally empowering for adults of all ages. The remaining four topics follow the format of the Awakening the Dreamer and Generation Waking Up experiences (Where are we? How did we get here?, What’s emerging?, Getting into Action) however the content of these topics have been substantially adapted for children. Four pages of text in the student workbook accompany each topic, with links to online enrichment activities and with reference to relevant video elements of the ATD symposium. We recommend ONLY discussing concepts of crisis (Where are we?) from your children’s lived experience and observation (the elephants in the room from a child’s perspective), before introducing or discussing broader scientific topics of crisis. For example: If the child does not already know about climate change, or consider its importance, it is NOT our adult priority to introduce this topic… it is our responsibility to respond to their existing knowledge and to accompany them on a learning journey to broaden that knowledge. For instance, they may know and be concerned about littering and waste, so by encouraging a student directed inquiry about littering and pollution, we may encourage them to broaden their thinking to include the impact of pollution on our climate and research other ways we are polluting our environment such as through carbon monoxide pollution from cars which results in climate change impacts… however, once we lead them to a new topic, it is and remains their choice to pursue the topic further. It is our reasonability to sow seeds, they will water them when they are psychologically ready to do so. Child-centred learning invites us to consider asking powerful questions, as opposed to providing concerning ideas. How can you create inviting, empowering and engaging questions for the children in your life?